This list is in the JSON format and is used to communicate the index of works between the JRP server and the user's web browser. The list is used to generate the contents of the Browse page, as well as provide information about works to other pages on the website, such as Work pages and the Census page. 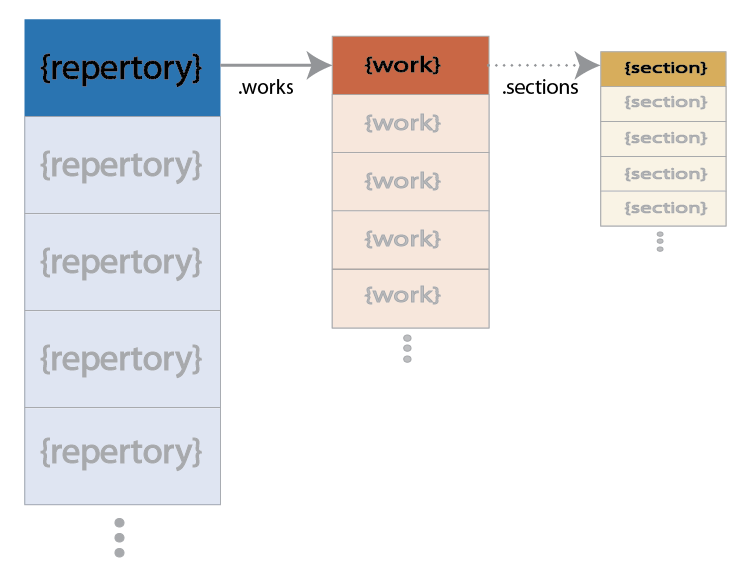 Each repertory entry in the base array of the worklist is represented by an object which contains the following parameters. Abbreviated name of the repertory. This is always a three-letter code starting with a capital letter, and it forms the first component of a JRP ID. The role of the repertory: either "composer" if the repertory represents the works of a single composer, or "repertory" if the repertory contains the works of multiple composers (who are named in each work object). The full name of the repertory, if the reprole is "repertory". The short name of the repertory, if the reprole is "repertory". The full name of the default composer for the repertory. Used if reprole is "composer". The short name for the default composer of the repertory. Used if repreole is "composer". Typically the name under which the composer will be alphabetized, such as "Josquin" for the full name "Josquin des Prez" or "Brumel" for "Antoine Brumel". The birth and death dates (if known) for the composer. The number of works in the data base for the repertory. An array of the work genres for the given repertory. Sorting method for the works entry; either "alphabetical" or "genre". Short repertory worklists are given alphabetically by title, while longer lists are sorted first by genre and then alphabetically within each genre. The total number of notes in all works for the given repertory. The nominal performance time in seconds of all works in the repertory. The number of PDF pages for all works in the repertory. An array of works for the repertory which are available in the JRP database. The name of a genre present in the worklist for the given repertory: mass, motet or song. The number of the repertory's works which have this genre label. The number notes in works of this genre in the repertory. The nominal performance time in seconds of all works in the given genre for the repertory. The number of PDF pages for all works in the given genre for the repertory. The JRP ID for the work. Textual information about a work variant. Anonymous works use this parameter to indicate the manuscript source. If the work is incomplete, this parameter is set to true. An attribution level, only given for works by/attributed to Josquin des Prez. Currently the levels are 1=securely attributed, 2=less securely attributed, 3=not securely attributed to Josquin. These levels are based on manuscript sources for the works, with secure attributions requiring at least two independent manuscripts indicating Josquin as the composer. Less securely attributed works generally have one early manuscript source citing Josquin as the composer. Not securely attributed works are typically given for works with no manuscript attributions to Josquin, or attributions to Josquin are only found in printed editions. The full name of the composer of the work if it is different from the default composer in the parent repertory object. The short name for the default composer of the work if it is different from the default composer in the parent repertory object. Typically it is the name under which the composer will be alphabetized, such as "Josquin" for the full name "Josquin des Prez" or "Brumel" for "Antoine Brumel". The genre of the work. The number of notes in the work. The nominal performance time in seconds of the work. The number of PDF pages for the work. The number of voices in the work. May not be an integer, such as "?" if the work is a fragment, and the original number of voices is unknown. Array of names for the voices in the work, listed from highest to lowest on the system. Example: Superius, Altus, Tenor, Bassus. Array of voice name abbreviations. Example: S, A, T, B. Array of the number of notes occurring within each voice in the work. Incipit height; the pixel height of the incipit image. This parameter is used to calculate page layout before an image arrives from the server. The Add Date for the work: the date on which the work was added to the JRP database. Date is an integer in the format YYYYMMDD. The Update Date for the work: the date that the work was last (substantially) edited. The JRP ID for the work. Does not map to a specific data file. Textual information about a work variant. Anonymous works use this parameter to indicate the manuscript source. Variant information may also be found at the section level. Set to true if the work is incomplete. The number of notes in the work (all sections). The nominal performance time in seconds of the work, summing the performance duration of all sections. The number of PDF pages for the section. The number of voices in the work. May be a range of numbers if the sections contain a variable number of voices. Not used at the work level for multi-sectioned works. The Add Date for the work. This is the most recent add date of any individual section in the work. The Update Date for the work. This is the most recent update date of any individual section in the work. An array of work section (movement) objects. The JRP ID for the section. The initial portion of the ID will match the work-level ID, and then add a lower-case letter indicating the section sequence, typically "a" for Kyrie, "b" for Gloria, "c" for Credo, "d" for Sanctus, and "e" for Agnus Dei. The title of the section, such as "Kyrie". Textual information about a section variant. Anonymous works use this parameter to indicate the manuscript source. The number of notes (note count) in the section. Similar to the work-level notecount parameter. The nominal performance time in seconds of the section. The number of voices in the section. Similar to the work-level voices parameter. Array of notes for the voices in the section, listed from highest to lowest on the system. Similar to the work-level vname parameter. Array of voice name abbreviations in the section. Similar to the work-level vabbr parameter. Array of the number of notes occurring within each voice in the section. Similar to the work-level vnotecount parameter. Incipit height; the pixel height of the incipit image. This parameter is used to calculate page layout before the image arrives from the server. The date on which the section was added to the JRP database. Similar to the work-level ad parameter. The date on which the section was last (substantially) changed. Similar to the work-level ud parameter.